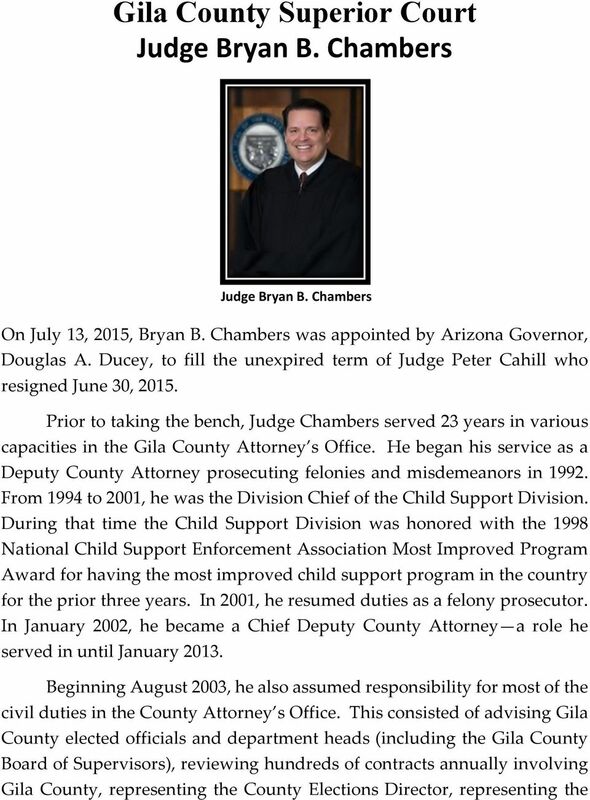 Download "Gila County Superior Court Judge Bryan B. 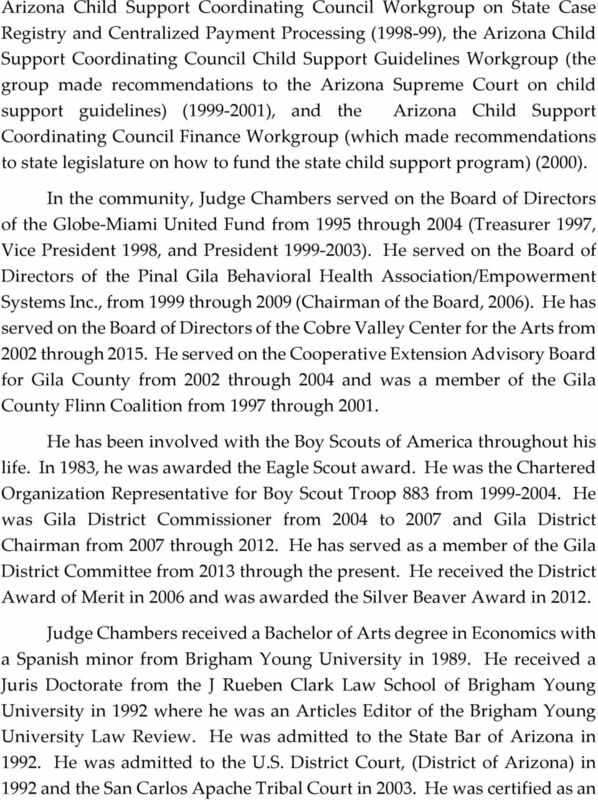 Chambers"
4 Arizona Special Education Due Process Hearing Officer ( ) and as an Arizona Elections Officer ( ). 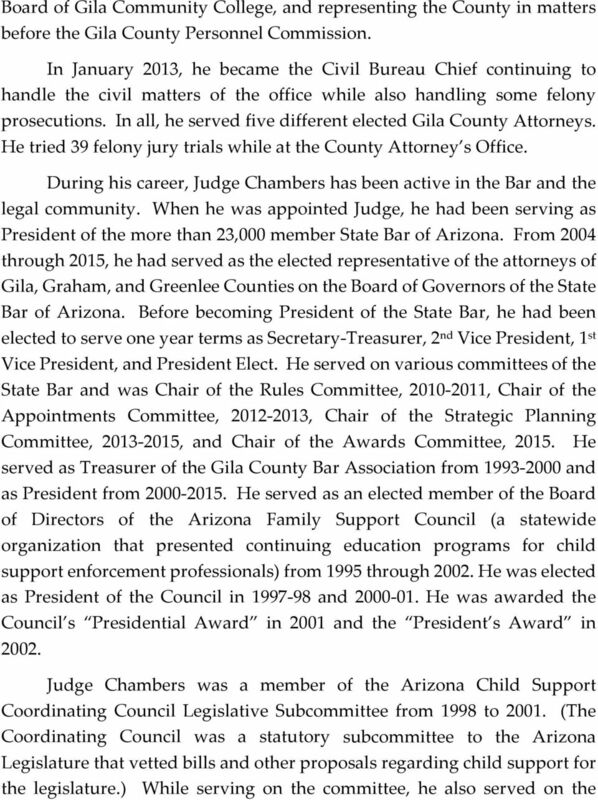 Judge Chambers has presented at local, state, and national continuing education conferences and has written legal articles. These include: Looking Back at City of Richmond v. J.A. Croson Co.: Its Effects on State and Local Set Aside Programs, 1991 B.Y.U. L. Rev Why a State Bar of Arizona? 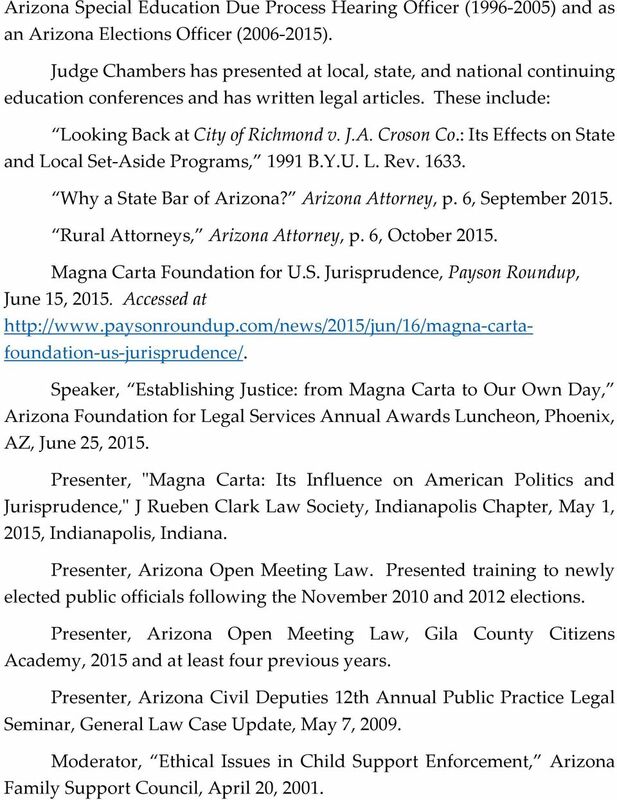 Arizona Attorney, p. 6, September Rural Attorneys, Arizona Attorney, p. 6, October Magna Carta Foundation for U.S. Jurisprudence, Payson Roundup, June 15, Accessed at cartafoundation us jurisprudence/. Speaker, Establishing Justice: from Magna Carta to Our Own Day, Arizona Foundation for Legal Services Annual Awards Luncheon, Phoenix, AZ, June 25, Presenter, ʺMagna Carta: Its Influence on American Politics and Jurisprudence,ʺ J Rueben Clark Law Society, Indianapolis Chapter, May 1, 2015, Indianapolis, Indiana. Presenter, Arizona Open Meeting Law. Presented training to newly elected public officials following the November 2010 and 2012 elections. Presenter, Arizona Open Meeting Law, Gila County Citizens Academy, 2015 and at least four previous years. Presenter, Arizona Civil Deputies 12th Annual Public Practice Legal Seminar, General Law Case Update, May 7, Moderator, Ethical Issues in Child Support Enforcement, Arizona Family Support Council, April 20, 2001. 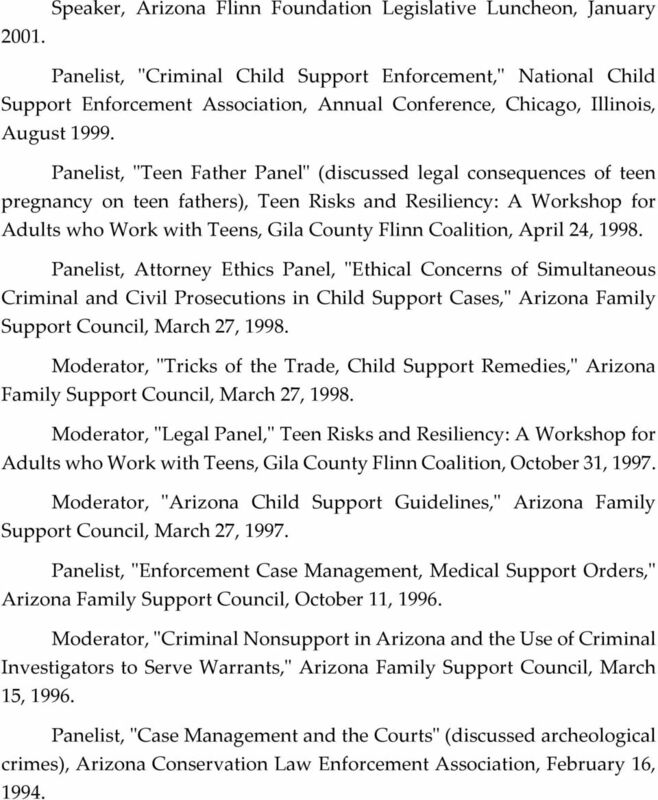 5 Speaker, Arizona Flinn Foundation Legislative Luncheon, January Panelist, ʺCriminal Child Support Enforcement,ʺ National Child Support Enforcement Association, Annual Conference, Chicago, Illinois, August Panelist, ʺTeen Father Panelʺ (discussed legal consequences of teen pregnancy on teen fathers), Teen Risks and Resiliency: A Workshop for Adults who Work with Teens, Gila County Flinn Coalition, April 24, Panelist, Attorney Ethics Panel, ʺEthical Concerns of Simultaneous Criminal and Civil Prosecutions in Child Support Cases,ʺ Arizona Family Support Council, March 27, Moderator, ʺTricks of the Trade, Child Support Remedies,ʺ Arizona Family Support Council, March 27, Moderator, ʺLegal Panel,ʺ Teen Risks and Resiliency: A Workshop for Adults who Work with Teens, Gila County Flinn Coalition, October 31, Moderator, ʺArizona Child Support Guidelines,ʺ Arizona Family Support Council, March 27, Panelist, ʺEnforcement Case Management, Medical Support Orders,ʺ Arizona Family Support Council, October 11, Moderator, ʺCriminal Nonsupport in Arizona and the Use of Criminal Investigators to Serve Warrants,ʺ Arizona Family Support Council, March 15, Panelist, ʺCase Management and the Courtsʺ (discussed archeological crimes), Arizona Conservation Law Enforcement Association, February 16, 1994. Judge Chris Oldner 416 th Judicial District Court Collin County, Texas PROFESSIONAL EXPERIENCE PRESIDING JUDGE 416 th Judicial District Court Collin County, Texas October 2003 present Appointed by Gov. THOMAS P. ALONGI Owner, Alongi & Donovan Law, PLLC 4015 S McClintock Dr #106, Tempe, AZ 85282 (480) 718-6840 tom@alongidonovanlaw. THOMAS P. ALONGI Owner, Alongi & Donovan Law, PLLC 4015 S McClintock Dr #106, Tempe, AZ 85282 (480) 718-6840 tom@alongidonovanlaw.com Bar Admissions Arizona State Bar & Bar Association N o 020973 (Dec.
IMPERIAL COUNTY. Review police reports to determine if criminal complaints should be filed. ETHICS IS EVERYBODY S BUSINESS The Ohio Ethics Commission "No man is allowed to be a judge in his own cause, because his interest would certainly bias his judgment, and, not improbably, corrupt his integrity." SO YOU WANT TO BE A JUDGE? PROGRAM University of Iowa College of Law October 19, 2012, 12:40-2:10 P.M. SO YOU WANT TO BE A JUDGE? PROGRAM University of Iowa College of Law October 19, 2012, 12:40-2:10 P.M. On October 19, 2012, the University of Iowa College of Law will host a So You Want to Be A Judge?